The first single malt produced in Ontario for more than a century - and it doesn't disappoint. This small-batch whisky, aged in ex-bourbon casks for a minimum of three years, offers a complexity and depth of flavour that many have described as beyond its years. This creamy, easy-drinking single malt is packed full of cereal, vanilla, malt, grape, pear, ginger and cinnamon notes, with a lingering fruit and spice finish. 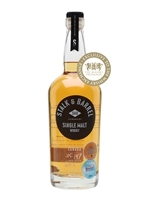 This cask strength version is a punchier version of the standard bottling and highlights the intense spice and fruit flavours.